Tuesday, Septmeber 29 1908 -- The Angels are finally returning to LA after another long road trip (right side of cartoon), and lightweights Danny Webster and Ad Wolgast are set to meet in the ring tonight at Jim Jeffries' Arena in LA. Wolgast will win, and had a long boxing career, but his is a very sad story of a punch-drunk fighter who ended up in and out of mental sanitariums. Connie, November 27 1938, courtesy of Cole Johnson. Carolyn Wells was born in Rahway, New Jersey, on June 18, 1862, according to a 1919 passenger ship list at Ancestry.com, which has a family tree with the names of her parents: William Edmond Wells and Anna Potter Woodruff. Wells’ birth date was also on her headstone. 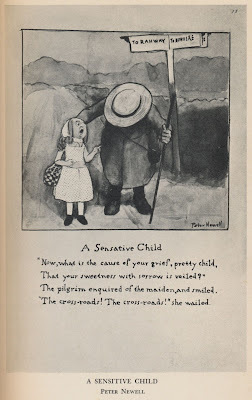 When I was six and my little sister was three, an aunt came to see us, and she came right from the sickbed of another niece who had scarlet fever. Doctors, nurses and relatives were not so careful of contagion then as now, and both my sister and myself fell ill of the dread disease. The other niece recovered, but my sister died, and I was left with an ever-increasing deafness. Wells said her deafness cost her a marriage proposal, invitations for overseas trips, gifts, plane rides and autograph requests. The 1870 U.S. Federal Census recorded Wells, her younger brother, Walter, and parents in Rahway. Her father was a life insurance agent. The 1880 census the Wells family of five resided on Elm Avenue in Rahway. Ida was the latest addition. 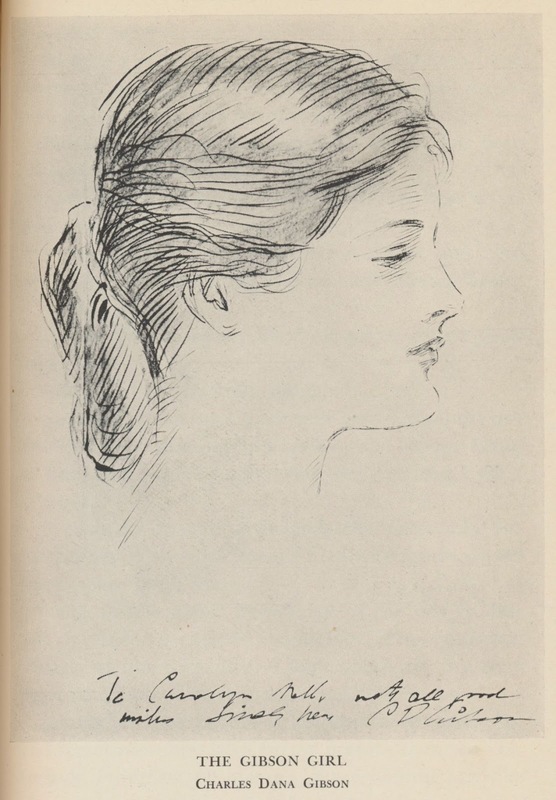 Wells’ first book was At the Sign of the Sphinx published by Stone and Kimball in 1896. The book was reissued in 1906. Her second and third books appeared in 1899: The Jingle Book followed by The Story of Betty. Journalist Wells and her sister remained in the household of their parents in the 1900 census. Their address was 98 Elm Avenue. 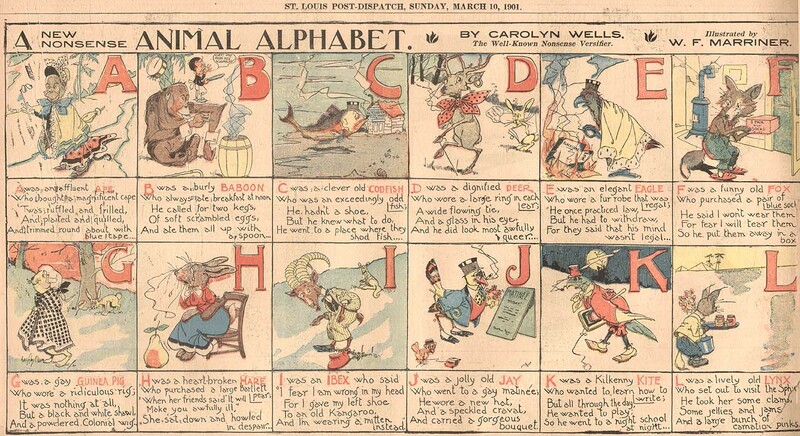 Wells first venture in the comics page was the Animal Alphabet, which ran March 10 and 17, 1901, in the New York World. The art was by William F. Marriner. A variation on Animal Alphabet was Animals from an Absurd Alphabet which appeared, incomplete, in the Los Angeles Herald on May 28 and June 11, 1905. 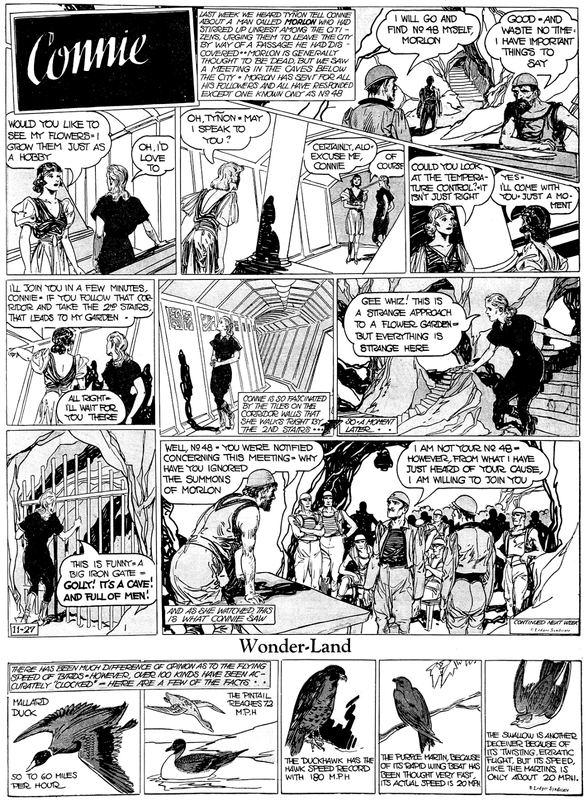 According to American Newspaper Comics (2012), Wells’ other series for newspapers were Dolly Drake and Bobby Blake in Storyland, after Margaret G. Hayes, with art by Grace Drayton; Adventures of Lovely Lilly with art by G. F. Kaber; Oh, Winnie! with art by Penrhyn Stanlaws; and Fluffy Ruffles with art by Wallace Morgan. Fluffy Ruffles was mentioned in a brief profile of Wells published by the Havre Herald (Montana), October 18, 1907. For the children’s magazine St. Nicholas, Wells wrote the five-part Happychaps which was illustrated by Harrison Cady; January 1908; February 1908; March 1908; April 1908; and May 1908. Wells was included in the article, “Men Who Make Laughter for the American Nation”, which was printed in the Washington Herald (Washington, DC), June 14, 1908. 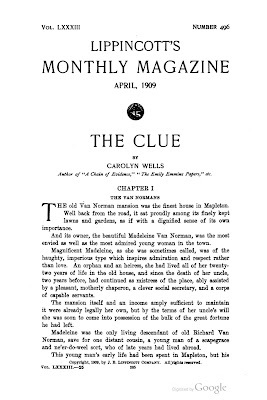 Wells also wrote for the mystery genre through her detective, Fleming Stone. 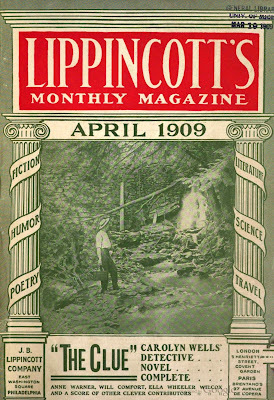 As far as I can tell, the first Fleming Stone story was “A Chain of Evidence”, published in Lippincott’s Monthly Magazine, September 1907. A book of the same title came out in 1912. 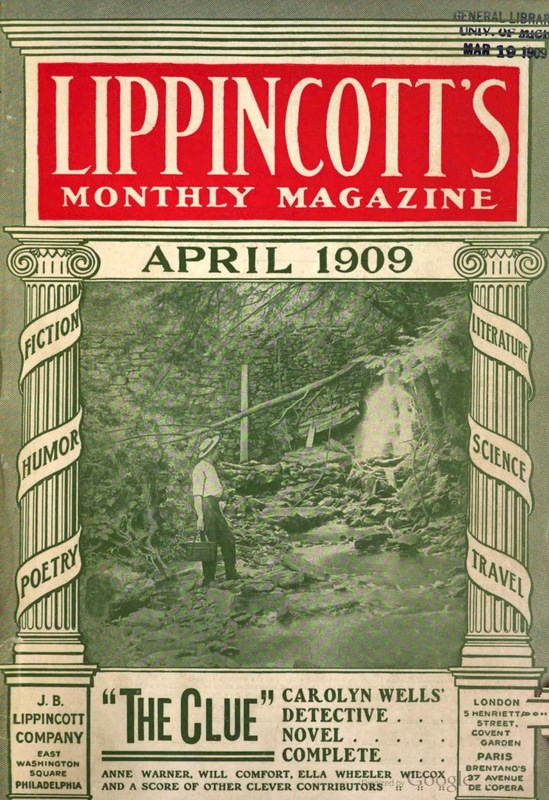 The first Fleming Stone novel, The Clue, was published in 1909, the same year it appeared in the April Lippincott’s Monthly Magazine. The Clue was serialized in newspapers. A list of Fleming Stone novels is here. 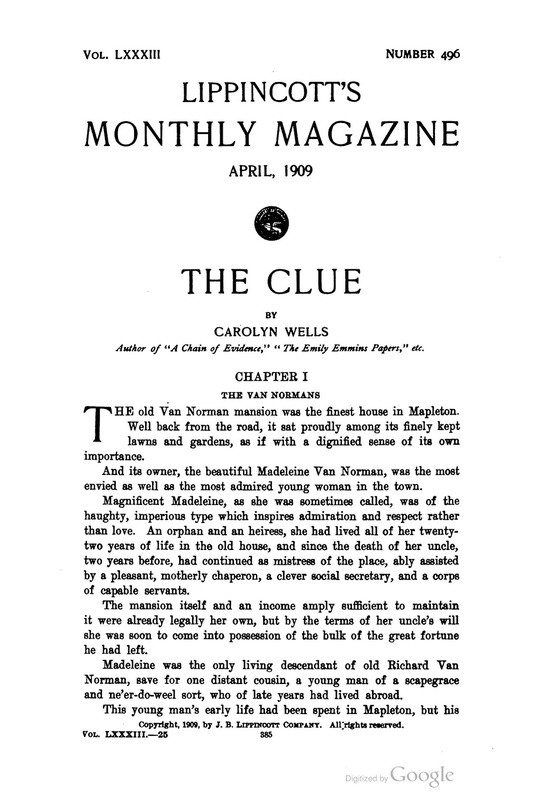 Wells’ book, The Technique of the Mystery Story, was published in 1913. In the 1910 census, Wells lived with her mother, a widow, in Rahway on Elm Avenue. The Evening World (New York, New York), February 8, 1918 published news of Wells engagement. 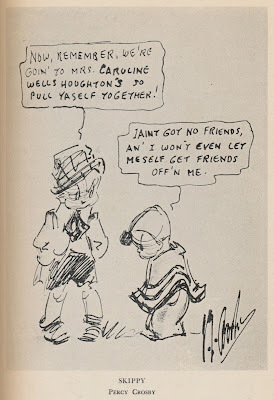 Miss Carolyn Wells, the writer, has let it be known that about Easter holidays, she is to marry Hadwin Houghton of No. 327 Central park West. The engagement has just been announced. Miss Wells and Mr. Houghton are friends of many years standing. Mr. Houghton is a son of the late Bernard Houghton go Boston, who was identified with the publishing house of Houghton-Mifflin & Co. Some details of the marriage appeared in the New York Tribune, April 2, 1918. According to the New York Death Index, at Ancestry.com, Wells’ husband passed away August 26, 1919. 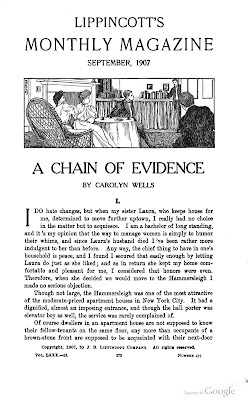 A photograph of Wells and excerpts from letters to her were printed in the New York Sun, June 1, 1919. 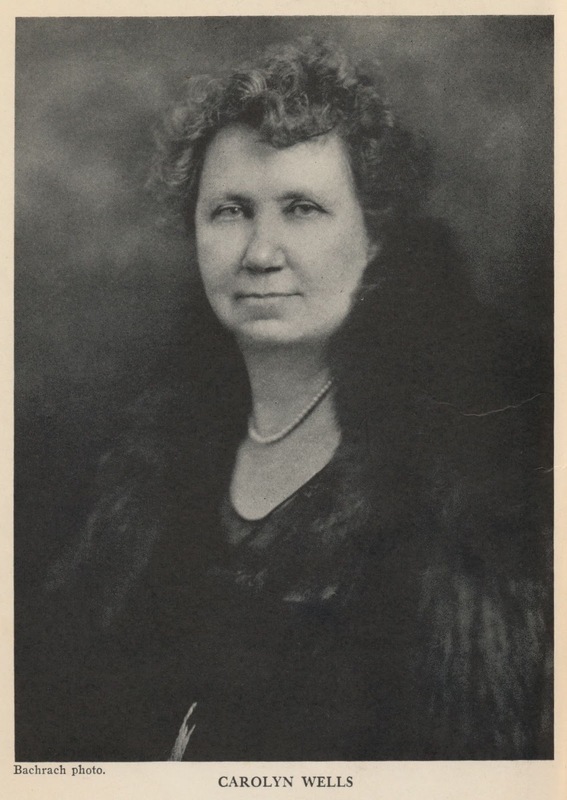 Thompson Feature Service advertised Carolyn Wells’ Today in History in Editor & Publisher, July 3, 1919. It’s not known if Today in History appeared in any newspapers. In December 1919, she visited Bermuda. Her address on the passenger list was 1 West 67th Street. The same address was recorded in the 1920 census. Wells’ occupation was writer in the book trade. On the same sheet, but at 15 West 67 Street, were Alphonse Mucha and his family, and Penrhyn Stanlaws. A 1925 Manhattan city directory listed her address as 1 West 67th Street. 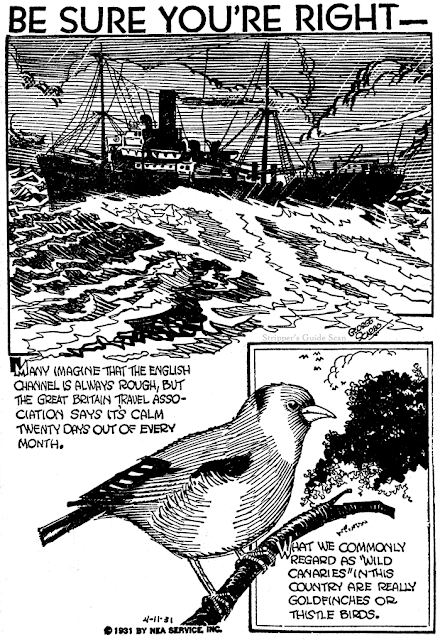 Wells’ works featured artwork by two leading illustrators, Nell Brinkley and Russell Patterson. The Adventures of Prudence Prim (1925–1926), The Fortunes of Flossie (1926–1927), and Pretty Polly (1928–1929) were drawn by Brinkley. Patterson produced The New Adventures of Flossy Frills (1941), Flossy Frills (1939–1940), and Flossy Frills Helps Out (1942). 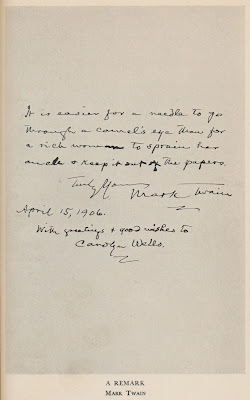 Artwork by Peter Newell, Percy Crosby and Charles Dana Gibson, and a note from Mark Twain to Wells, from The Rest of My Life, are shown below. Among the people Wells knew were Theodore Roosevelt, Oliver Herford, Thomas Edison, George Ade, and Kate Douglass Wiggen Riggs. 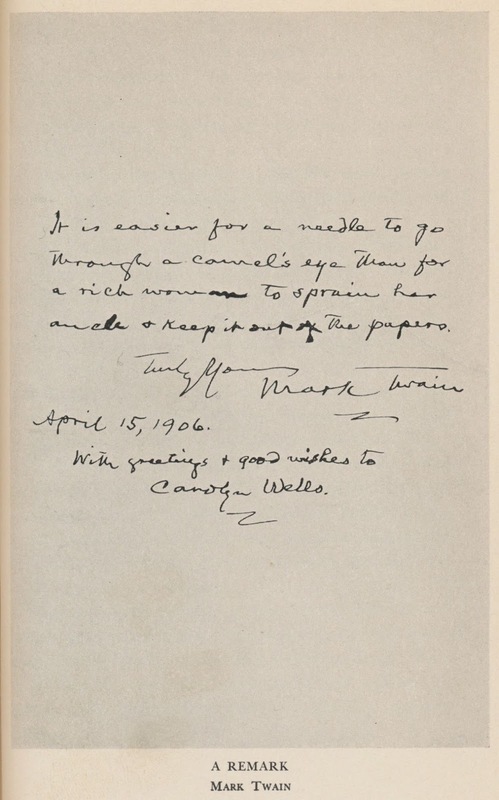 Wells bequeathed her Walt Whitman collection (nearly 500 items including rare editions) to the Library of Congress. Wells passed away March 26, 1942, in New York City at the Flower-Fifth Avenue Hospital, according to the New York Times, March 27. She was buried next to her husband at the Rahway Cemetery. 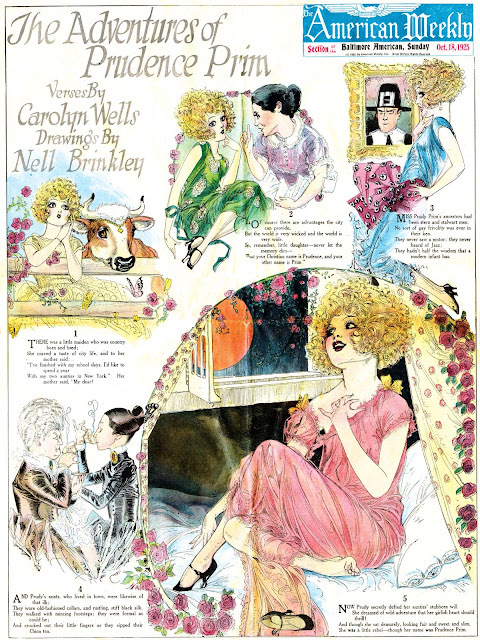 Perhaps one of the least affected of Nell Brinkley's magazine cover series, which tended toward a tone verging on high opera, is The Adventures of Prudence Prim. Accompanied by the delightful but slight versification of Carolyn Wells, Brinkley does what she does best, without the high drama trappings and pared down to the essentials --- pretty girls, lovingly drawn. The Adventures of Prudence Prim ran on the covers of Hearst's American Weekly Sunday magazine sections from October 18 1925 to February 21 1926. I did not break my mouse hand trying to restore this sample, as you can see all the Brinkley covers you'd could want, all lovingly and beautifully restored, in "The Brinkley Girls" by Trina Robbins. I urge you to pick up a copy. I have 9 of these + a "The Fortunes of Flossie + an Ethel Hays of "Love's Labor Lost" from July 14, 1929. Are these worth anything? Peter George Scarbo was born in Minnesota on August 10, 1898, according to his World War I draft card. He has not been found in the 1900 U.S. Federal Census. In the 1905 Minnesota Decennial Census, he was the oldest of three sons born to Gustaf and Gertrude; his family name was spelled “Skarbo” which was the spelling for his grandfather and father in the 1895 Minnesota Decennial Census. His father was a Norwegian emigrant and a farmer. In the 1910 census the family lived in Cass Lake, Minnesota; the village did not have street addresses. His father was a laborer who did odd jobs. Scarbo signed his World War I draft card on September 12, 1918; he spelled his surname with a “c” instead of a “k”. His occupation was laborer and described as medium height and build with blue eyes and brown hair. In 1920 the Scarbos, with a “c”, remained in Cass Lake; the family had added a daughter. Scarbo and his father worked at a saw mill. Information on his art training has not been found. His father passed away in April 1929 according to the Minnesota, Death Index, 1908-2002 at Ancestry.com. Scarbo married Margaret when he was 27 years old, according to the 1930 census. The couple and his mother lived in Toledo, Ohio at 1232 1/2 Superior Street. He was a newspaper artist. In April 1933 he took over the art chores on The Clownies. Other strips he produced were Scrapbook Sketches, Animal Cracks, and Comic Zoo. At some point before 1935 he moved to Cleveland where he lived at 11906 Brighton, according to the 1940 census. The newspaper artist had four years of high school education. Scarbo passed away on February 13, 1966 in Cleveland. His death was reported in The Plain Dealer (Cleveland, Ohio) on February 15. George Scarbo, 67, a cartoonist for the Newspaper Enterprise Association for 30 years, died Sunday on Lutheran Hospital after a long illness. He came to Cleveland in 1931 from Toledo, where he had worked for the old Toledo News-Bee. 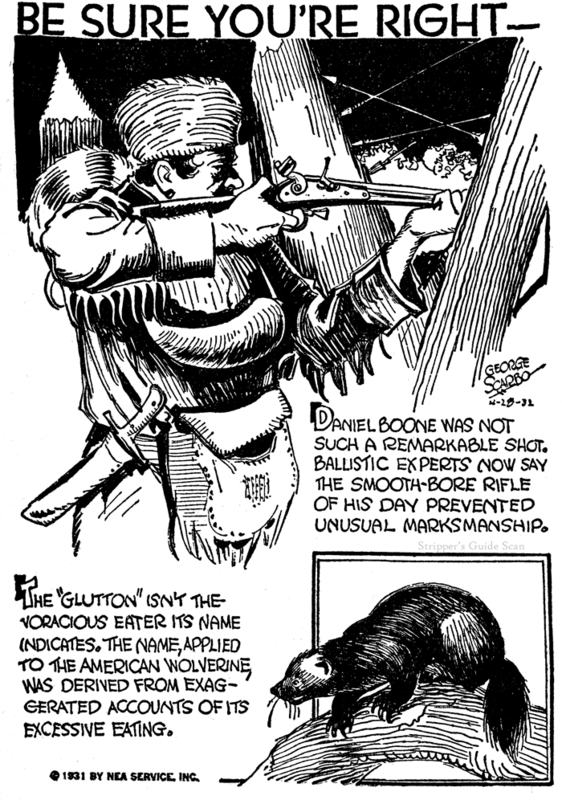 In 1934 he started a comic strip called "Tiny Mites," but soon returned to editorial cartoons. Mr. Scarbo is survived by his wife, Margaret; two brothers, Herman and Arthur, and his mother, Gertrude, all of Cass Lake, Minn. The Scarbo home is at 11906 Brighton Avenue S.W. Services will be at Our Savior Lutheran Church, 20300 Hilliard Boulevard, Rocky River, at 1:30 p.m. today. His mother passed away April 1973 according to the Social Security Death Index. George Scarbo is one of my favorite funny animal cartoonists. "The Comic Zoo" has such rich drawing in it, and beautiful inking. I'm not sure if he favored pen or brush. The little bear characters he did were certainly worthy rivals of Jimmy Swinnerton's pioneering bear cartoons. 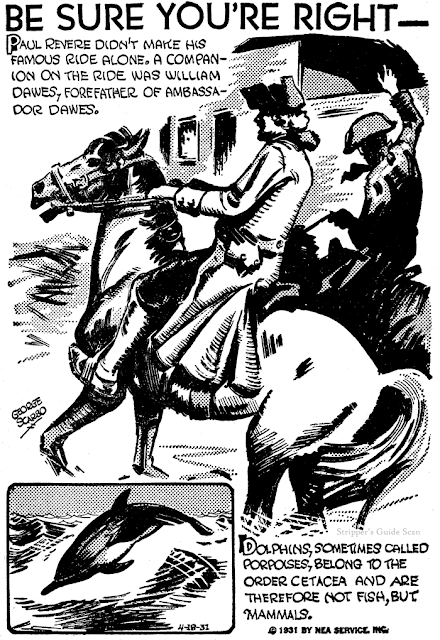 I wish there was a book collection of "The Comic Zoo". Thanks Allan and Alex Jay for throwing the spotlight over Scarbo's way. The great cartooning gifts of George Scarbo were wasted for awhile on this panel cartoon titled, rather smugly, Be Sure You're Right. In the great race to imitate Robert Ripley's Believe It or Not in the 1930s, the NEA syndicate came up with a weakling one-two punch. Three times per week you got Scarbo's Be Sure You're Right, and on the other three weekdays you got William Ferguson's Mother Nature's Curio Shop. Thankfully, it wasn't long before Scarbo talked himself out of this job, and Ferguson's panel about nature's curiosites was renamed This Curious World and promoted to seven days per week. Be Sure You're Right ran from December 2 1930 to May 8 1931.